The Mad Men influence is back and coming to a wardrobe near you. Slick 50s styling meets updated modern silhouettes in a game-changer for classicism. Oatmeal linen single breasted jacket, Gieves and Hawkes; White linen shirt, Stenströms; Navy and cream geometric motif silk tie, Rubinacci; Suit blue cotton trousers, Cordone; Brown socks, The London sock company; Viceroy standard plain ballpen, Yard-o-Led. It’s probably safe to assume that the majority of you have seen the hit TV-series Mad Men, which follows the rollercoaster lifestyle of Don Draper, a suave, well-dressed and classically handsome advertising guru as he navigates his way through and up the fast-paced world of consumerism in the 1960s and 1970s. It’s perfectly executed in every possible way, however, the show’s styling has deservedly garnered its own sartorial fanbase. As such, it formed the basis of inspiration when The Rake staked out an incredible apartment in Burlington Gate, a new luxury development on Cork Street in London's Mayfair. 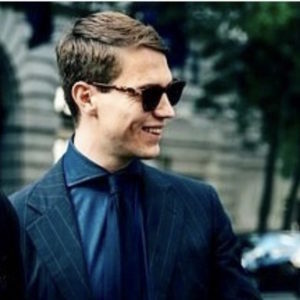 With tailored jackets and high-waisted, pleated trousers performing the role of his suits of armour in the arena of the corporate boardroom, juxtaposed against casual knitwear pieces and cashmere pyjamas for when he lets his guard down, each day he’s dressed in nothing but noble fibres and sharp silhouettes from the likes of Kit Blake, Gieves & Hawkes, Edward Green, Rubinacci and more. We don't recommend the 40-a-day, bottle of Scotch lifestyle of Mr Draper but we can certainly recommend his polished sense of style, of which you can achieve at TheRake.com. 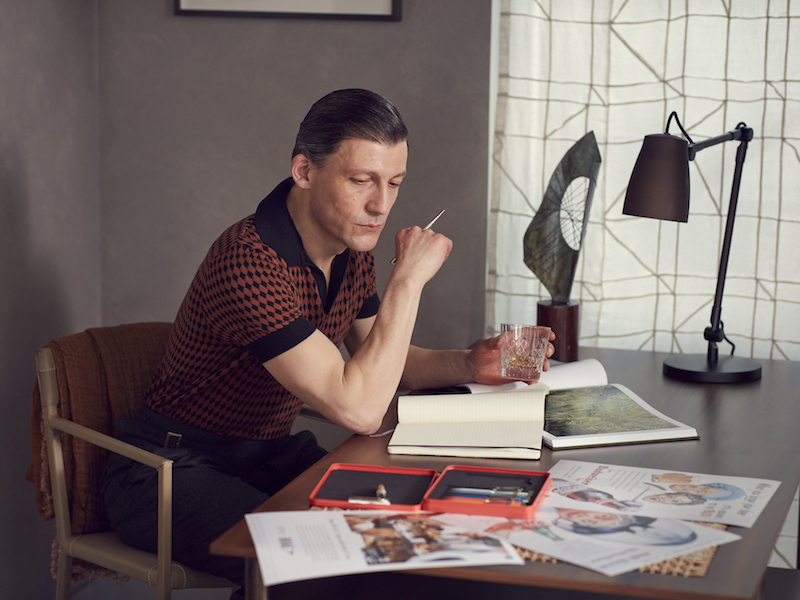 Tobacco and black diamond jacquard-knit polo shirt , AA Doppiaa; Grey manny pleated wool and cashmere trousers, Rubinacci. 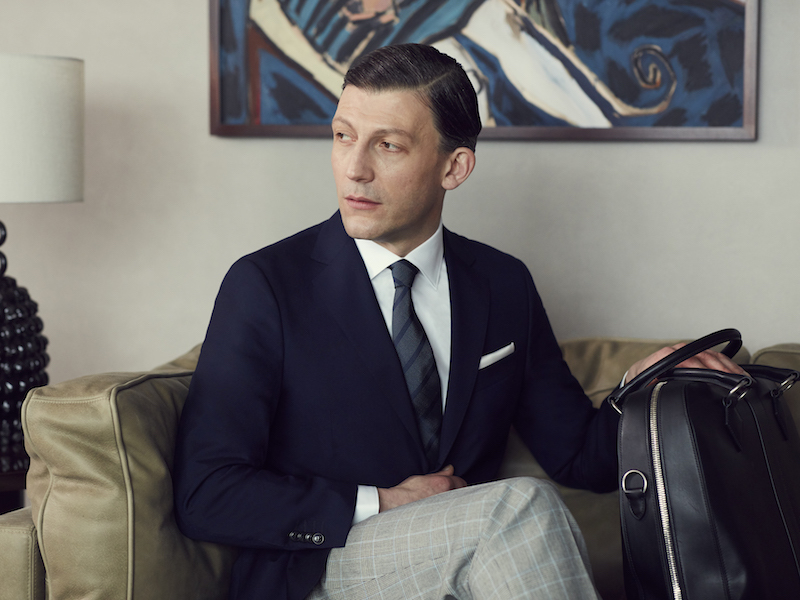 Blue wool falk single breasted jacket, Oscar Jacobson; White cotton shirt, Gieves and Hawkes; Blue silk stripe tie, Drakes; White and green essential silk pocket square, Sera Fine Silk; Grey wool Blake check Aleksandar pleated trouser; Kit Blake; Le petit voyage overnight briefcase atelier calfskin in Black, Metier. With thanks to Burlington Gate. Browse its incredible property portfolio, here.